Any concession to Syriza could translate into an electoral boost for Spain’s own anti-austerity party, Podemos. “Solidarity is one thing—but it’s quite a different thing to have solidarity and not ask for anything in return,” said Spanish Prime Minister Mariano Rajoy in a radio interview on June 30, when asked about the position the European Union should adopt toward Greece. The PM was widely ridiculed for his obvious misunderstanding of the notion of solidarity—inadvertently revealing one of the EU’s design flaws. But his attitude illustrates how national politics are shaping Europe’s approach to the Greek crisis. Spain has been among the countries in the European Union most fiercely opposed to debt relief for Greece. This has less to do with Spain’s share in Greek loans than with its governing party, the conservative Partido Popular (PP), which has tied its fate to the EU’s politics of austerity. Luis de Guindos, Spain’s economy minister, tried to compete with Jeroen Dijsselbloem, the current Dutch Socialist leader of the Eurogroup, for his position in what was billed as a “political showdown” between Europe’s center-left and center-right blocs. (De Guindos lost his bid on July 13, and Dijsselbloem was reelected.) For Rajoy, de Guindos, and others in the PP, any concession to Syriza, the far-left party now governing Greece, suggests that there may be an alternative to the EU’s current approach, translating into an electoral boost for Spain’s own anti-austerity party, Podemos. 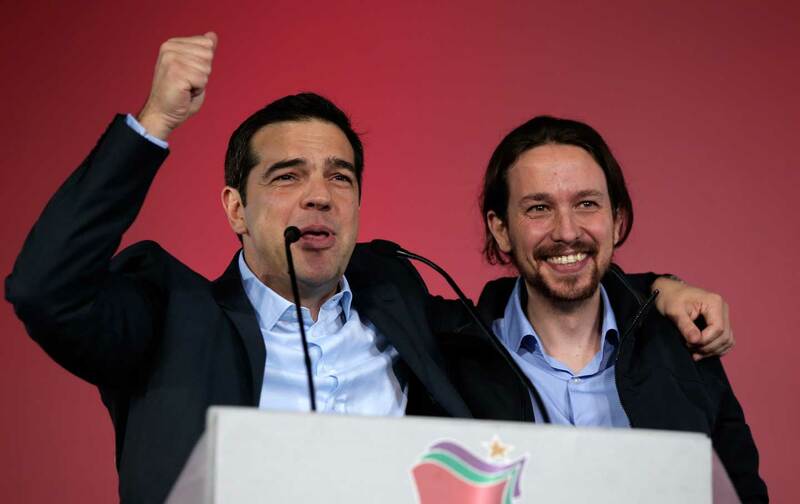 With Podemos expected to mount a stiff challenge to the PP in the general elections later this year, the PP has had to balance its fierce opposition to Syriza, Podemos’s ally, with its desire that Greece stay in the eurozone. Strangely, it’s the PP that today insists on comparing Spain and Greece—a strategy meant to scare Spain’s electorate into voting for austerity as the only guarantee to stay in the euro. Even on the right, many have criticized this fear-mongering tactic of “hacer números” (“racking up numbers”), also known as arriolismo, referring to the longtime PP strategist Pedro Arriola, the Karl Rove of Spanish politics. But the trick may work yet again for Rajoy in the upcoming national elections: Recent polls estimate that a plurality of Spaniards (43 percent) favor the Eurogroup’s position in its negotiations with the Greek government. A scenario eerily similar to Greece’s predicament today beset Spain during the summer of 2012, when Rajoy entered into negotiations with the Eurogroup to address a major debt crisis. At that same time, the tides were turning in Greece: Pasok was imploding and Syriza was quickly filling the void. On June 10, 2012, Spain became the fourth and largest EU country to receive bailout money (over €100 billion) from the Eurogroup and the IMF. Rajoy’s decision to placate the EU by cutting the budget, raising general taxes, and cutting pensions and social security hamstrung Spain’s already depleted workforce. Unemployment numbers would peak at nearly 27 percent the following year; today they’re just under 24 percent. Not surprisingly, however, the cacophony of dissent among PSOE’s younger members has been growing for months. For some, Sánchez’s endorsement of the ‘yes’ vote was the last straw. Beatriz Talegón, a rising young star in the Socialist party and member of its federal committee, announced on the day of the referendum that she was leaving the PSOE over Greece and broader disagreements over the party’s political stances. She is slated to join Alberto Sotillos, who left the party last month, to found an independent leftist party that may draw more young PSOE members. How this week’s last-ditch agreement between Greece and the EU will shape Spanish politics is hard to predict. Some on the left think that the impact will be negligible, because the upcoming general elections will narrowly focus on national issues. Still, a lot will depend not only on how the Greek story plays out but also on how it gets told. The narrative is anything but clear. While Tsipras has had to make important concessions, the Greek resistance to the EU, including the referendum, has helped make visible a broad, transnational coalition against austerity—including everyone from citizen activists across Europe to prominent Western economists such as Paul Krugman, Jeffrey Sachs, and Thomas Piketty. The emergence of this front has forced some of the main players in this drama—including the IMF and the European Council—to acknowledge the need for debt relief, weakening Germany’s dogmatic position in the court of European public opinion. Slowly but surely, the adjectives are switching sides. “His positions are irresponsible and can bring disaster,” said Gianni Pittella, who heads up the center-left bloc in the European Parliament, on July 11. He wasn’t referring to Tsipras but to German Finance Minister Wolfgang Schäuble.